Prep. Time: 20 min. | Cooking Time: 25 min. Trained at Le Cordon Bleu Culinary School, Chef Charbel Robert Adaimy has sizzled at such prestigious establishments as the Ritz Carlton and the Belvedere Restaurant at The Peninsula Hotel in Beverly Hills. 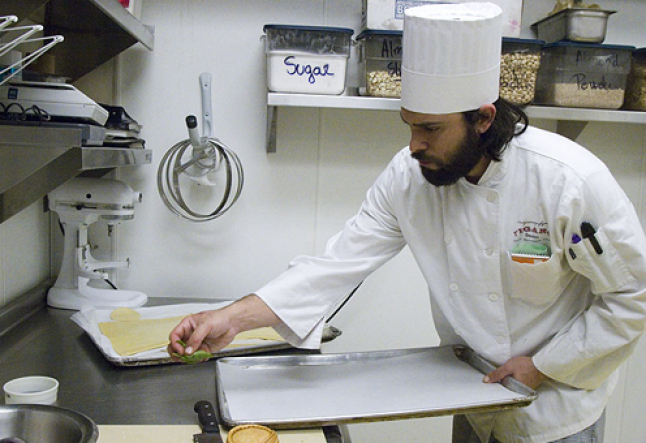 As the Head Chef at Figaro Bistro, he utilizes organic products to promote a healthy delicious diet. in this recipe, he dishes out his Vegetable Vol-au-Vent. 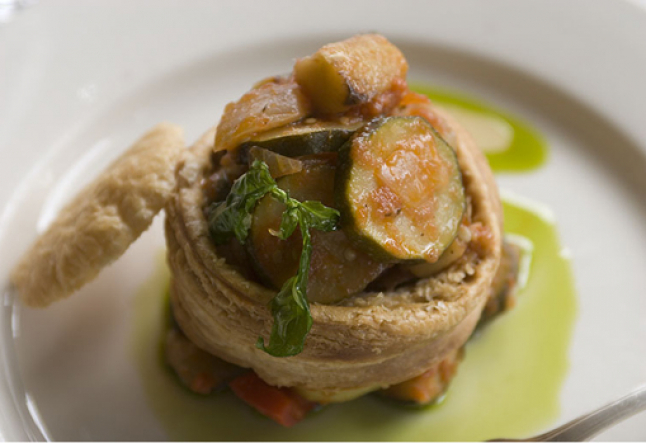 Traditionally, a vol-au-vent is a light pastry shell filled with a ragout of meat or fish. 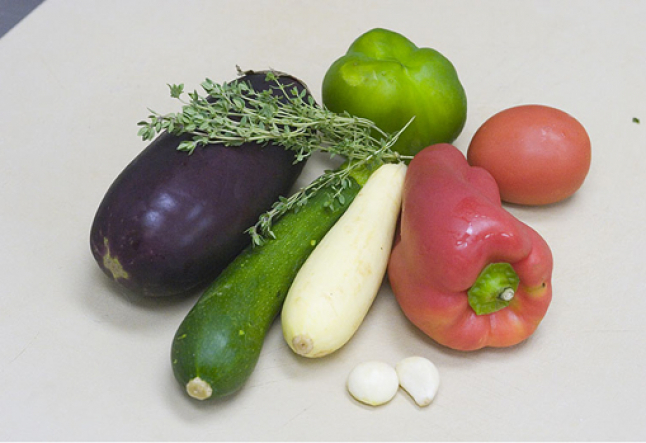 In this recipe, the traditional meat has been replaced with a delicious vegetable ratatouille. This dish can work beautifully as a summer lunch entrée or the puff pastry can be cut into smaller circles for bite-size hors d’ oeuvres. 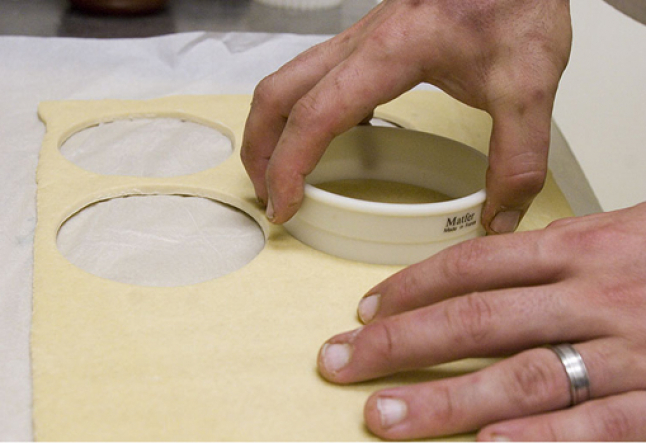 Step 1 : Using a cookie cutter or the rim of a small bowl, cut two 6-inch circles out of the puff pastry dough. Take one of the circles and cut out a 5 and 3⁄4-inch circle leaving a very delicate donut shape. Take that donut shape and place it over the remaining 6-inch circle. It is now ready to be baked. Step 2: Bake the puff pastry in an oven preheated to 400 degrees for twenty minutes. Remove from the oven once the shell has become golden and flakey and allow it to cool. Step 3 : Once it has cooled, turn the shell so the ring is facing downward. Gently take a paring knife and cut around the lip of the lid. Once you have cut all the way around the lid, lift it off. The vol-au-vent is ready to be stuffed. Prep the Vegetables: Cut the zucchini into 1⁄2-inch slices. Next, peel the eggplant and dice into 1⁄2-inch squares. Slice the onions into 1⁄4-inch slices. Then, core and seed the bell peppers and dice into 1⁄2-inch squares. Chop the garlic, quarter the tomatoes, and pluck the leaves off the thyme stems. 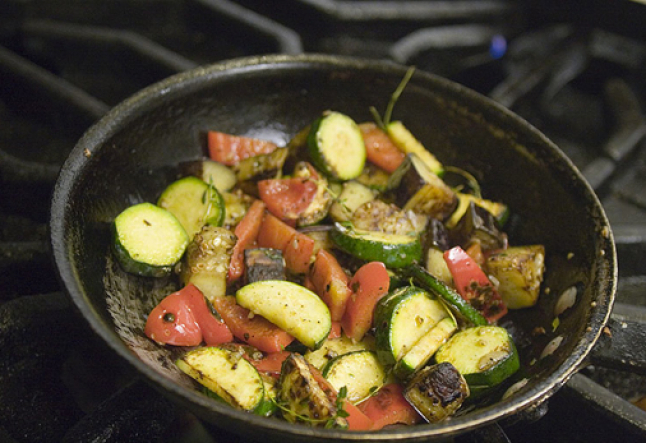 Saute the Vegetables: Saute the zucchini over high heat in a little olive oil, cooking until browned and set aside. Then, saute the eggplant over high heat, adding a little more olive oil than you used with the zucchini because the eggplant will act like a sponge absorbing more oil than the other vegetables. Cook until browned and combine with the zucchini. Next, saute the onions over high heat with a little olive oil until caramalized and combine with the other vegetables. Repeat this step with the tomatoes and peppers. Once all the vegetables have been sauteed, combine them in a pot that has been preheated over high heat. Add the garlic, ground pepper, and thyme and saute for 30 seconds. Then add the tomato sauce. Bring the mixture to a boil and then pour it into the vol au vent shell. Enjoy your Vegetarian Vol au Vent! Notes & tips: You can garnish the vol-au-vent with any number of summer herbs like basil leaves or a basil puree. You can also use some of the leftover puff pastry dough to decorative twists or other shapes.